AMMONNEWS - Jordan's top priority is to end the crisis in Syria and normalize the situation in the neighboring Arab country, so as the voluntary return of refugees to their homeland is possible, said Minister of Foreign Affairs and Expatriates Ayman Safadi. "We encourage the return of the refugees to Syria as quickly as possible", the top diplomat told reporters in a joint press conference with his French counterpart Jean-Yves Le Drian, referring to burdens Jordan shoulders due to hosting 1.3 million Syrian refugees. Safadi and Le Drian, who arrived in Amman yesterday, held talks in which bilateral ties, investment, economy, Middle East and security topics defined their one-on-one meeting. "The French minister's visit to Jordan is the second in less than a year, which reflect the long-standing ties and solid partnership between Amman and Paris that led to a number of meetings and calls between His Majesty King Abdullah II and President Emmanuel Macaron", Safadi stated in the press briefing. He said number of agreements in various areas, including transport, communications, energy, tourism, culture bind both nations, adding that the volume of trade exchange between them reached more than $ 400 million until last October, noting that the French investments are the largest among non-Arab foreign investments in Jordan. Safadi pointed out that he held fruitful talks with the French minster on cementing partnership in political, economic, trade, defense and security fields. The two countries will work together and in partnership with the international community to create a political horizon to progress towards the two-state solution, whose prospects are being undermined due to Israeli unilateral acts, Safadi confirmed . He underlined France’s stands in support of the two-state solution, citing the Paris Conference on the Middle East in 2017, and the key role Paris played in UN Security Council Resolution 2334, which states that Israel’s settlement activity constitutes a "flagrant violation" of international law and has "no legal validity". He also pointed out that the Syrian crisis figured high during talks, besides ways to consolidate efforts to realize a political solution to the crisis in the neighboring Arab country. 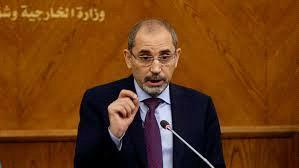 Safadi, moreover, pointed to implications of the U.S. decision to withdraw military forces from Syria, and said Jordan is working with the U.S., France and Russia, among other countries to reach the envisioned solution. The top diplomats meeting also discussed efforts to break through the current impasse in the peace process, affirming the absence of a solution would further breed despair and frustration with the risk of unleashing yet another threat to regional and international security.
" We will work together in collaboration with the international community on developing a political horizon towards a two-state solution, which Israeli unilateral measures jeopardize chances of its realization", Safadi emphasized. For his part, Le Drian said he was delighted to be back in Jordan after six months from his last visit to the Kingdom. "Such visits on a regular basis mirror the long-standing ties between Jordan and France. I have sensed the confidence whilst meeting with King Abdullah and talks with minister Safadi underscore the genuine partnership between our two nations, which never been stronger", Le Drian stated. He,further, spoke about anti-terrorism efforts and said it was a duty to ward off terrorists and their return to the Middle East.